You're in business because you provide solutions. You've got answers. You're the (wo)man with the plan. Let's take a look at some of our customers, for example. AmeriFirst Home Mortgage helps home buyers find the right mortgage for them. In The News helps businesses memorialize their accomplishments with custom lamination and engraving. HubSpot helps marketers get an end-to-end view of their marketing activities to determine which channels provide the most ROI. Notice how none of those explanations of what each company provides focused on the specific product or service? That's because the product or service isn't what makes a lead want to be your customer -- it's a solution to their problem that people care about. Your business is successful because it provides some solution, but if your campaigns seem to be flailing a bit, it may be because you haven't applied that problem-solving principle to your marketing. Not yet, anyway. This post will give you plenty of ideas to implement that will make your marketing more solution-oriented. That way, your prospects see you as a helpful problem solver they actually like and trust ... not just a peddler of your product or service! 1) Create how-to blog content. As most inbound marketers know, success starts with content; so begin by writing blog posts that solve peoples' problems! If you'll allow me to get meta for a minute, this very blog post about how to be a problem solver is, well, solving a problem. People reading this presumably want to know how to inject more problem solving into their marketing, and this post is providing solutions to that problem. When writing your how-to blog content, focus on providing actionable advice. There's already a ton of content out there that says a lot without really saying anything at all. But you want your content to give you credibility and authority; you can do that by making sure your reader walks away from the blog post with at least one thing he or she can do to be better. 2) Create lead gen offers that make people's lives easier. Helpful content doesn't end with blog posts, nor does successful marketing. You need to convert that blog traffic into leads, and if you've written some amazing content, your readers will probably want to learn more from you. 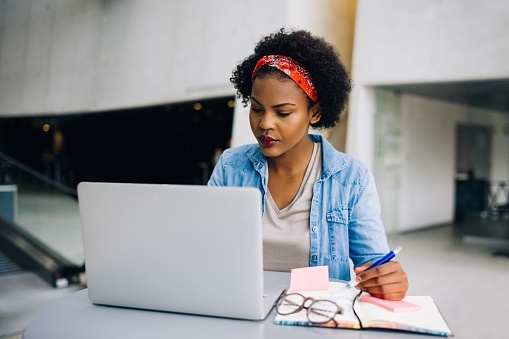 Create lead gen content that will help your readers be more successful -- at work, at home, whatever it is your customers need. For example, HubSpot has released tons of ebooks that show marketers how to do something, like set up their Facebook page timeline, for instance. Or perhaps you'd like to create some templates for your audience, like we did with our downloadable leads waterfall graph that we encourage all marketers to use. If you're looking for some inspiration, we've written an entire guide to creating lead gen offers quickly. 4) Leverage the brainpower of your community. Part of being a helpful, solution-oriented marketer is connecting people with content that solves their problems ... regardless of the source. Look, nobody knows everything. You're surrounded by people that have data, research, insights, and experiences from which your audience would benefit. Tap into that brainpower, and be the one to share it with the rest of your community! We're doing this now, in fact, with our push for our social media community to contribute ideas for our next blog post. Want your Twitter username FT'd on the greatest list of marketing pet peeves? Respond with what annoys YOU! Follow us to hear the best ones. Not only is this an excellent way to build strong relationships with others in your industry, but it also shows that you're committed to providing answers for people regardless of the source. 5) Monitor and respond to social media inquiries. Speaking of social media, your active presence on social sites can contribute to your reputation as a thought leader, problem solver, and all around awesome business. This means more than just monitoring your Twitter stream for questions you can answer, though. Think outside of the box a bit! Visit places like LinkedIn Answers, Quora, and industry forums to see what problems people are having. 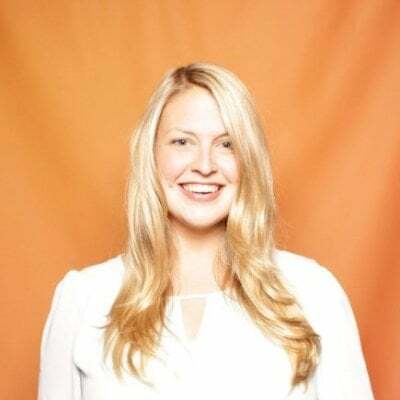 Take a look at how HubSpotter Meghan Keaney Anderson improved both HubSpot's clout, and her own, by answering Scott's question on Quora. 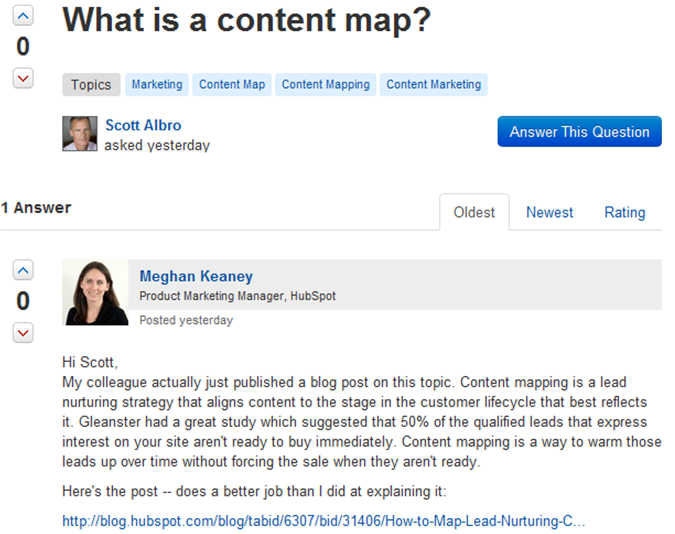 Take special note of how she linked back to a blog post HubSpot wrote that answers his question, too! 6) Optimize for long-tail search. Long-tail search is a critical component of any well-rounded SEO and content strategy, and it provides tremendous opportunity for marketers that are looking to be more solution-oriented with their content. 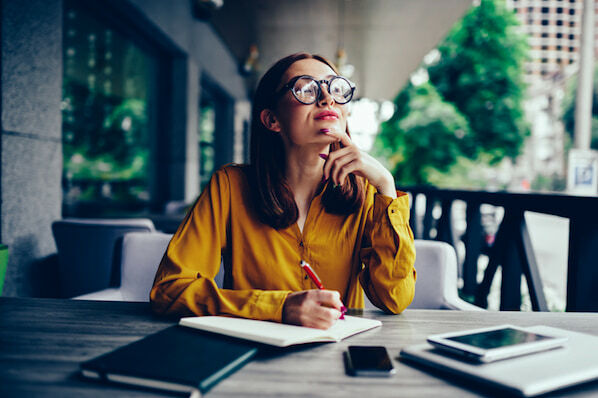 That's because many long-tail keywords are centered around interrogative queries, like "what makes a good blog post," or "where should I host my blog," or "how to start a blog." Not only does centering content and SEO around long-tail keywords of this nature give you another avenue to assert yourself as a helpful marketer instead of a pushy salesperson, but it also helps you achieve higher search rankings quicker, and with a more niche market than short-tail and head terms allow. And if the keywords provide solutions to evergreen problems -- in other words, problems that your audience will always face -- your website will also enjoy ongoing organic traffic as a result of your high ranking for these long-tail queries! 7) Nurture leads with emails based on their problems. Now that you have all of this fantastic, solution-oriented content, you should use it to nurture your leads! After all, you can't have a successful lead nurturing program without a full arsenal of content. Consider segmenting your lists and creating lead nurturing tracks that address specific buyer problems. You can identify the problems right in your landing page forms. Take a look at the optional field we at HubSpot include on almost all of our landing pages to allow us to do this type of nurturing. By asking leads to identify their biggest marketing challenge, we get a better idea of what problems our audience face so we can create content to address it, and simultaneously target prospects in our email sends according to the problems they need an answer to. 8) Create apps and tools that help solve a problem. Tools and apps -- especially free ones -- are mutually beneficial for businesses and their audience. 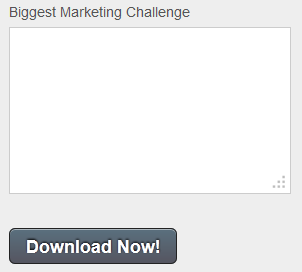 Let's take one of HubSpot's free tools, Marketing Grader, as an example. 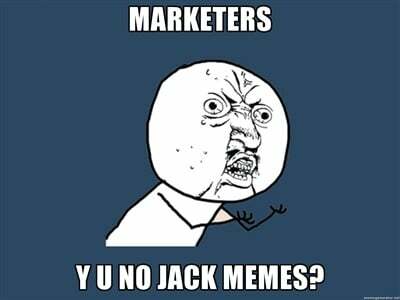 Marketing Grader helps solve a problem many marketers face ... they don't know how good their marketing is. When you enter your website into the free tool, you get a comprehensive report that tells you not just an arbitrary grade, but also actionable advice on exactly what areas of your marketing need improvement, and how you can do it. It even provides links to content that helps solve your problems. So ask yourself: "Self, is there a tool or mobile app I could develop to help my leads and customers?" If there's a problem people in your industry face, make your business the one that solves it! 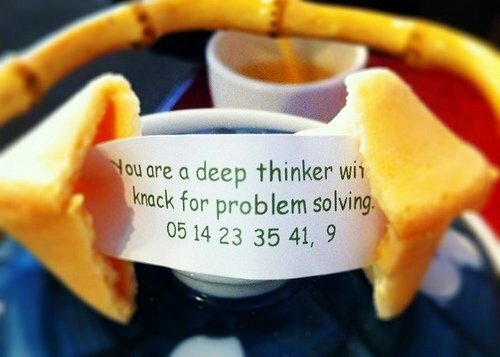 How do you inject problem solving into your marketing to gain the trust and loyalty of your prospects?